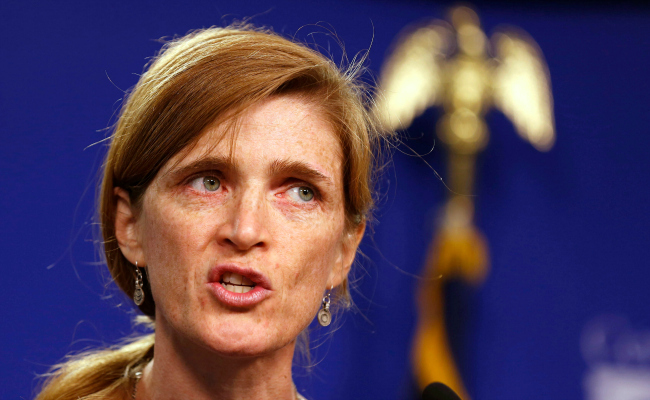 Samantha Power explained in detail why the world's great multilateral body has stopped functioning when it comes to Syria. Less than two months after being sworn in as the new U.S. ambassador to the United Nations, Samantha Power stood before a crowd of Washington reporters and members of the international press to deliver a sharp rebuke of the goings-on at the international body that is her new professional home. A liberal interventionist whose human rights advocacy helped shape the views of a generation of thinkers, she laid out in fresh detail conflicts within the UN Security Council that have derailed U.S. attempts to use the UN to put pressure on Syria over what she called "the uniquely monstrous crime that has brought us to this crossroads." Power's training as journalist and story teller -- she won the Pulitzer for her 2003 book A Problem from Hell: America and the Age of Genocide, about U.S. inaction in the face of the massacres in Rwanda -- was evident in her speech at the Center for American Progress, a progressive think tank and advocacy organization that has close ties to the Obama administration. She used color and detail to make her case for why all other options had been exhausted and a military strike was the only remaining option, bringing in the human interest story of a "father in al-Guta saying goodbye to his two young daughters." It felt a little emotionally manipulative. Because ultimately, she was not there to make the case for a humanitarian intervention on behalf of the people of Syria, but to deliver the administration's case for upholding the international norm against chemical weapons by conducting a punitive bombing campaign against targets held by Bashar al-Assad. At this stage, the diplomatic process is stalled because one side has just been gassed on a massive scale and the other side so far feels it has gotten away with it. What would words in the form of belated diplomatic condemnation achieve? What could the international Criminal Court really do, even if Russia or China were to allow a referral? Would a drawn-out legal process really affect the immediate calculus of Assad and those who ordered chemical weapons attacks? We could try again to pursue economic sanctions, but even if Russia budged, would more asset freezes, travel bans and banking restrictions convince Assad not to use chemical weapons again when he has a pipeline to the resources of Hezbollah and Iran? Does anybody really believe that deploying the same approaches we have tried for the last year will suddenly be effective? Of course, this isn't the only legitimate question being raised. People are asking, shouldn't the United States work through the Security Council on an issue that so clearly implicates international peace and security? The answer is, of course, yes, we could if we would -- if we could, we would, if we could, but we can't. Every day for the two-and-a-half years of the Syrian conflict, we have shown how seriously we take the UN Security Council and our obligations to enforce international peace and security. Since 2011 Russia and China have vetoed three separate Security Council resolutions condemning the Syrian regime's violence or promoting a political solution to the conflict. This year alone Russia has blocked at least three statements expressing humanitarian concern and calling for humanitarian access to besieged cities in Syria. And in the past two months Russia has blocked two resolutions condemning the generic use of chemical weapons and two press statements expressing concern about their use. We believe that more than 1,400 people were killed in Damascus on August 21, and the Security Council could not even agree to put out a press statement expressing its disapproval. The international system that was founded in 1945, a system we designed specifically to respond to the kinds of horrors we saw play out in World War II, has not lived up to its promise or its responsibilities in the case of Syria. And it is naive to think that Russia is on the verge of changing its position and allowing the UN Security Council to assume its rightful role as the enforcer of international peace and security. In short, the Security Council the world needs to deal with this urgent crisis is not the Security Council we have.